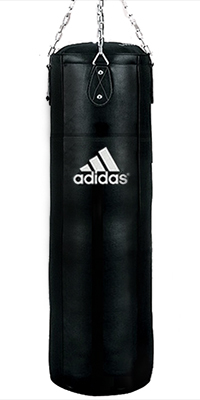 This Adidas Punching bag is made of Leather. It is ideal for heavy use and easy to maintain. The accessories are available and each sold separately. This is a High quality 2.2mm thick genuine buff calf leather with black trimming. Four parts heavy duty spot welded chains with swivel. Improved retainer box, separable pin with auto locking slider zigzag zipper filled with textile cutting and lined with 10mm Starmax foam. Material: Genuine Buff calf Leather.